How to correctly ride and keep control at the faster galloping gaits. We spend much of our time in the saddle honing the walk, trot and canter, but there are two other speeds that are required in English disciplines: the hand gallop and the gallop. In the good old days of open countryside and huge hunt fields hacking out was a no-brainer to many riders. Since there was space to ride horses at speed, the hand gallop and gallop were part of a rider’s repertoire. Sadly today, open countryside has given way to housing developments and strip malls, and enclosed arenas replace show fields. Fast riding is now a skill that must be learned by both horse and rider. And learn it you must if you want to compete in any of the jumping disciplines, keep your dressage horse moving forward, or condition your equine athlete. The hand gallop and, in particular, the gallop differ from the canter in many ways. The canter comprises three beats: the outside foreleg and the inside hind leg hit the ground at the same time. The other two legs hit independently. This creates the three beats. The canter speed is an average 375 meters per minute. The hand gallop is a little bit more forward, clipping along at 400 to 450 mpm, but still maintaining the three beats of the canter. Because the gallop requires a further extension of the limbs it is a four-beat gait, with every leg hitting the ground independently. The gallop is anything above 450 mpm, depending upon the ability of the horse. The hand gallop is used in lower levels of eventing and frequently in jumper competition. It is also used as a schooling exercise for dressage horses to create a more forward and expressive canter. The hand gallop is a good way to introduce the novice rider to the gallop. Todd Karn, United States Equestrian Federation (USEF) “R” hunter and equitation judge, says that hand gallop on the flat isn’t required in under saddle hunter classes anymore. The gallop is where event riders shine. In fact, they do most of their cross-country work at the gallop. 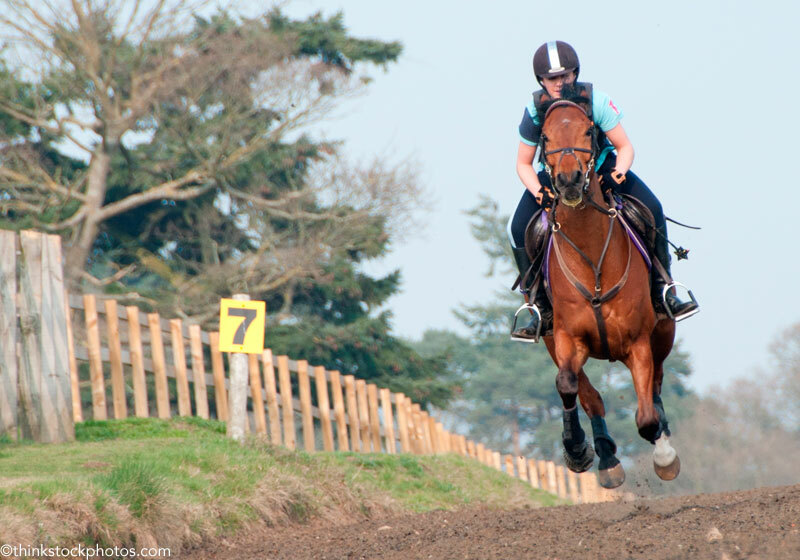 Proper training that incorporates galloping is also a great way to get horses fit. Sustained heart rate from galloping is necessary to prepare horses for eventing and other fast sports, such as endurance riding. Galloping, when done correctly, can also help develop stronger soft tissues. Both gaits are ridden in the two-point position, which requires a more closed hip angle, about 30 degrees, at all disciplines. But there are really no hard and fast rules on how closed the hip angle must be for eventing. The reins are held in the usual way in the hand gallop. In the gallop you can hold your reins in either the half bridge or the full bridge. In the half bridge you stretch one end of the rein across the horse’s neck so that you’re holding two pieces of leather in one hand. For the full bridge you stretch both ends of the rein across the horse’s neck so that both hands are holding two pieces of leather; the reins will be stretched across the horse’s crest instead of hanging in a loop alongside the neck. We’ve all seen the way the cowboys start their gallop in the movies, with a “yee haw” and a kick, and away they go. This galloping style is a Hollywood urban myth. Racehorses aside, for the English rider, the best way to begin a gallop is to build it up slowly. This is because some horses can get high on the speed. A fast start can undo the hard work and training you’ve put in to get your horse obedient and listening to your aids. Packaging of the stride goes back to your work on the flat. If your horse listens to your half-halts you can regulate his stride. Stopping comes from control also learned during flat work. Hours spent over time training your horse to be responsive to the aids is going to pay off in safety, controllability and enjoyment. For the hand gallop, start from a normal canter on the flat, come out of the saddle in a two-point and encourage your horse to move forward. Although the hand gallop is not normally used in hunter-under-saddle classes, it might be asked for in general schooling or breed shows. Remember, the judge isn’t looking for an all out gallop. Hand gallop means the horse is still “in hand” or in control. Lengthening the stride and slightly increasing the speed is what you’re shooting for. When jumper riders gallop in a class against the time they treat the gallop the same as the hand gallop but a little bit quicker, yet not so fast that they pull the fence down. To practice this, Todd says to gallop toward the fence and then slow down or “balance up” a few strides in front of the fence to allow your horse to get his legs up underneath him to jump. Excellent explanation of the gallop and hand gallop, thank you! I honestly did not know much about hand galloping before, so this article halped a lot. very helpful! and AMEN! that 1st paragraph is so sad but so true! Wonderful information! Yesterday I went into a hand gallop and did absolutely horrible. Reading this helped me realize what I did wrong. Thank you! I just went to the National show @ Lake Erie on Sunday May 3rd (I think) and they hand galloped. I understand the term more now. Thanks! I am learning to event, and my experienced friend and I were on a trail in an open field they use to practice hand-galloping. They got me to try it, and this article has really helped me understand what to do in the future so my hand-gallop is not out-of-control.